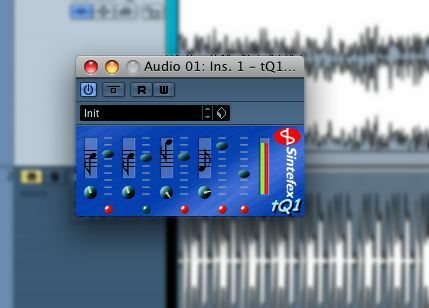 tQ1 by Sintefex is a simple equaliser plugin, currently undergoing beta test. tQ1 by Sintefex is a simple 4 band equaliser, designed to be an alternative to the built-in equalisers present in most DAWs. tQ1 does not use any computationally expensive algorithms (no convolution or modelling for example). It provides 4 bands switchable between peak and shelving equalisers (two bands can be high shelves, two bands can be low shelves). The algorithm has been carefully auditioned to sound better than many simple EQ's to our ears. The plugin supports mono or stereo use. tQ1's on-screen footprint has been kept as small as possible while retaining visual functionality, as we realise that desktop space is at a premium. We also kept the front panel simple, as the operation is obvious. tQ1's parameter values are displayed as the control is moved. You can right click a control to enter a value manually. tQ1 does not provide a graph of the frequency response, since you can hear it. tQ1's "width" control is rotary, and is in arbitrary units from 1.0 to 9.9 for a "bell" boost or cut. The maximum setting of width selects a shelf. "About" information can be obtained by clicking on the right hand logo area of the background. Download tQ1 Beta from our Software Download Site. The beta download may be used free of charge, but subject to the licence conditions contained in the "readme.txt" file included with the plugin. It is available as a VST 2.4 plugin, and an RTAS plugin for Protools. It is available for Windows (XP and Vista) and Mac (Minimum OSX 10.4, PPC and Intel). The beta product does not have an installer, you simply unzip it and place the contents in the plugin folder, as directed in the file "readme.txt" included in the zip file. Please note that the beta test product has a limited lifespan. However it will never (intentionally) fail to function due to exceeding its time limitation, so you do not need to worry about it one day stopping working. It will however warn you when it is beyond its lifetime, to encourage you to update to a new beta version or to install a release version when available.